A gallery wall is a great way to dress up a blank wall. 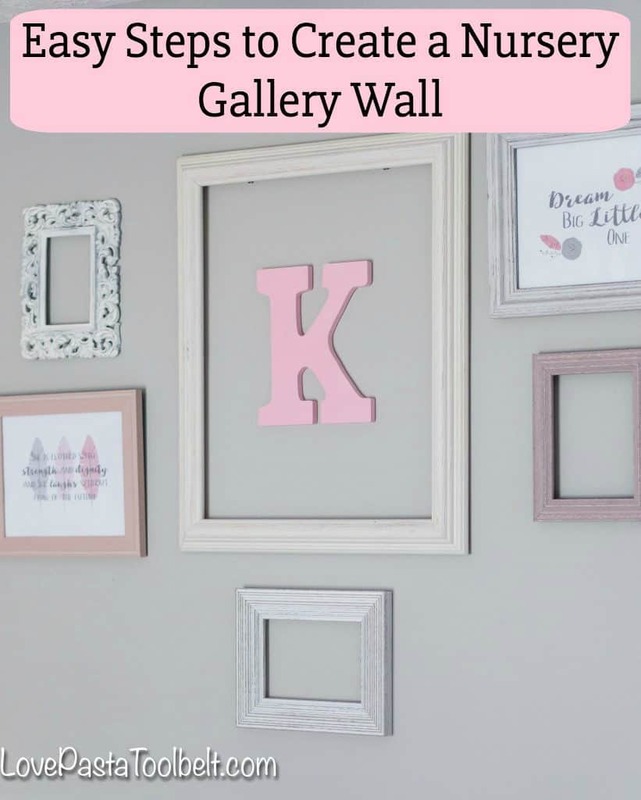 We created a gallery wall for K’s nursery and I’m sharing Easy Steps to Create a Nursery Gallery Wall. We’ve been doing a lot of work around our house lately. Ok who are we kidding, anytime we have a free weekend we normally end up doing at least one house project. 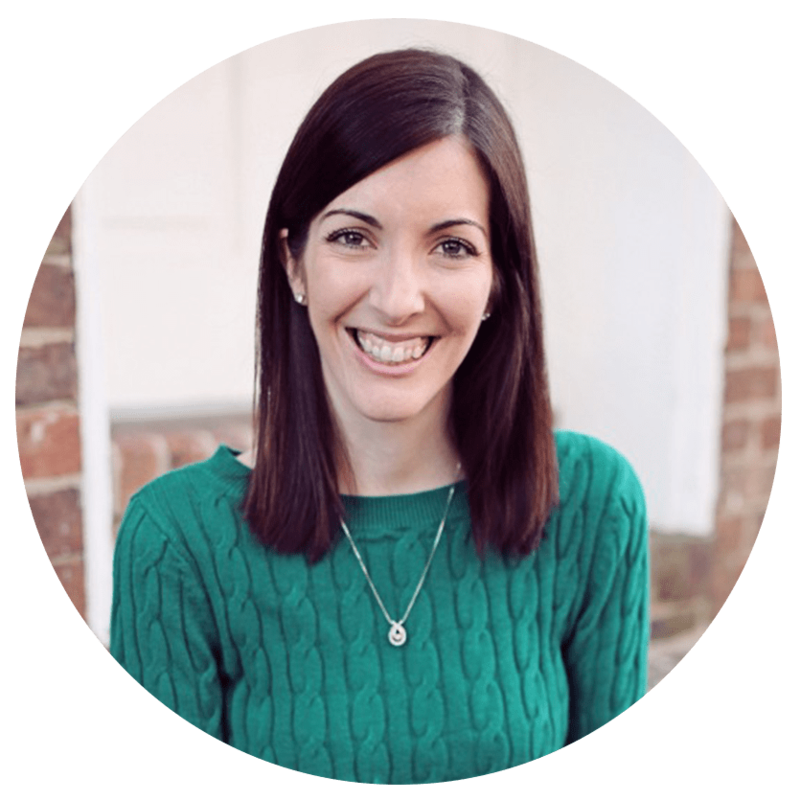 Home ownership can seem like a never ending task but most of the time we love it, you know until your stove and air conditioning break within like two weeks of each other and you just had a baby (yes that happened to us). One of the things I’m loving are gallery walls. 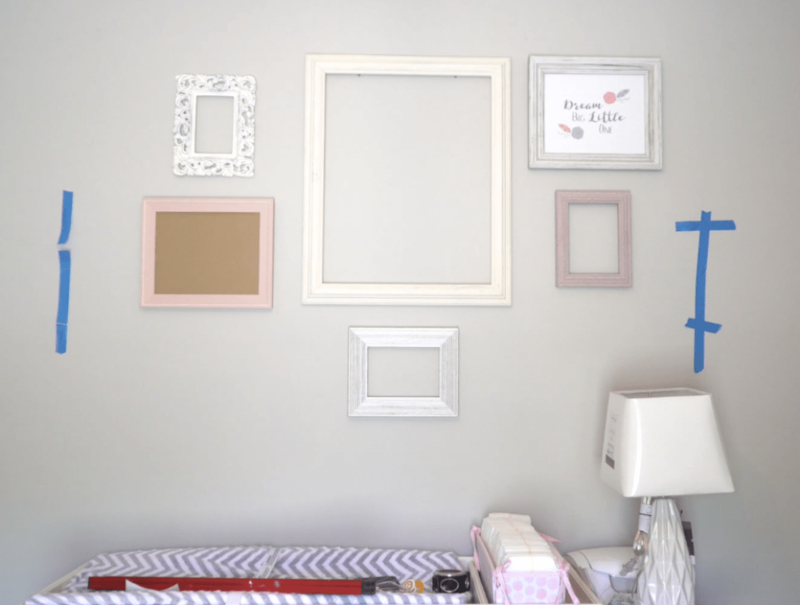 I was so excited when we put together K’s room to create a fun little gallery wall above her changing table. One of the tricky parts was figuring out where each of the frames would hang and how to get them hung in the right spot. My husband came up with a brilliant idea to get this gallery wall done right so I wanted to share the steps with you. 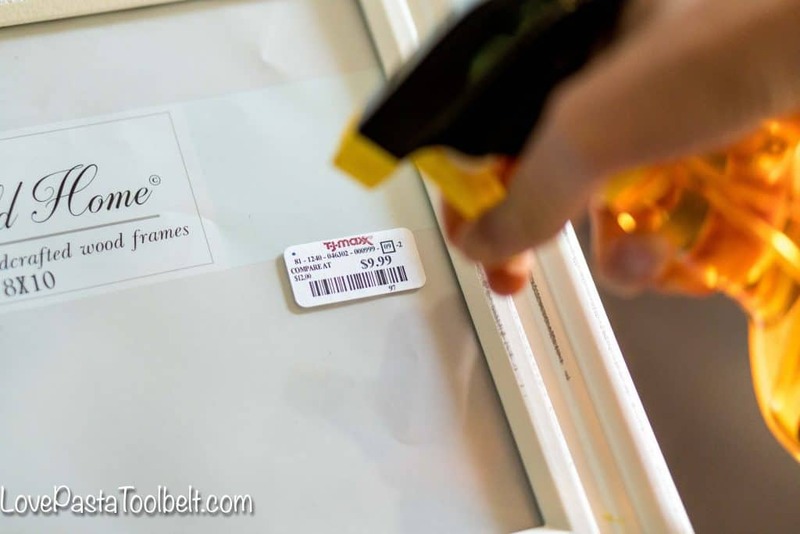 The first step is to collect the frames you want for your gallery wall. 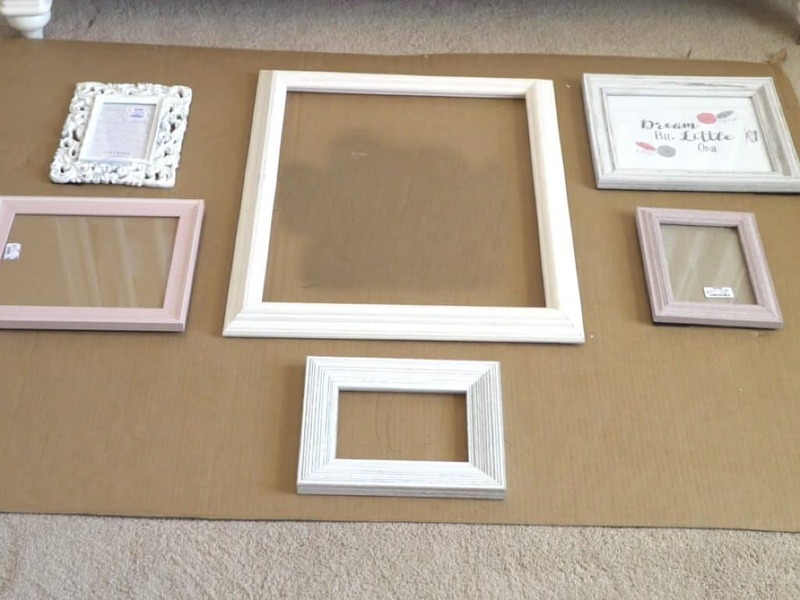 For K’s nursery I started picking up any gray, white/cream, or pinkish frames whenever I saw them. I got the frames mainly from stores like TJ Maxx, Ross and Marshalls. 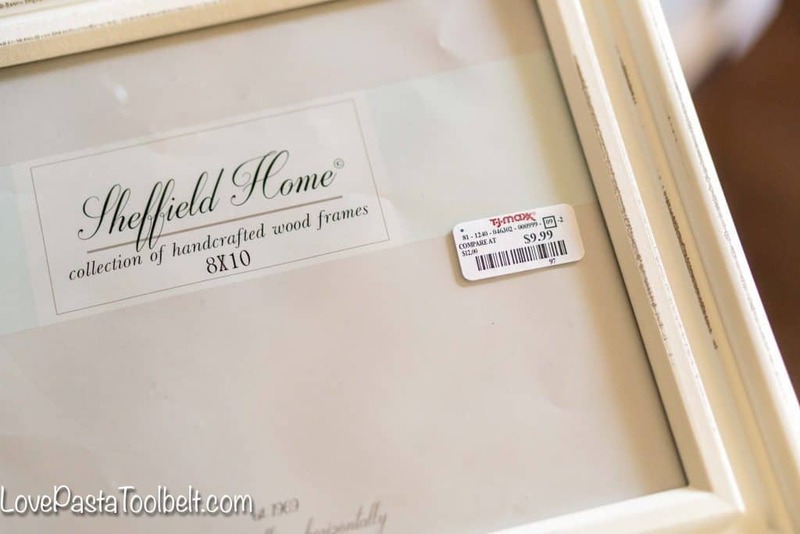 I loved perusing these stores for frames because they offer such a good variety. After I picked up the frames the next step was the annoying task of getting those darn price stickers off. I never understand why they have to be on the glass because it’s such a pain to get them off. Fortunately I picked up some Goo Gone Spray Gel at Lowe’s, in the aisle with the cleaning supplies, and the stickers came off so easily! Once I had the frames I had to decide what would go in them. 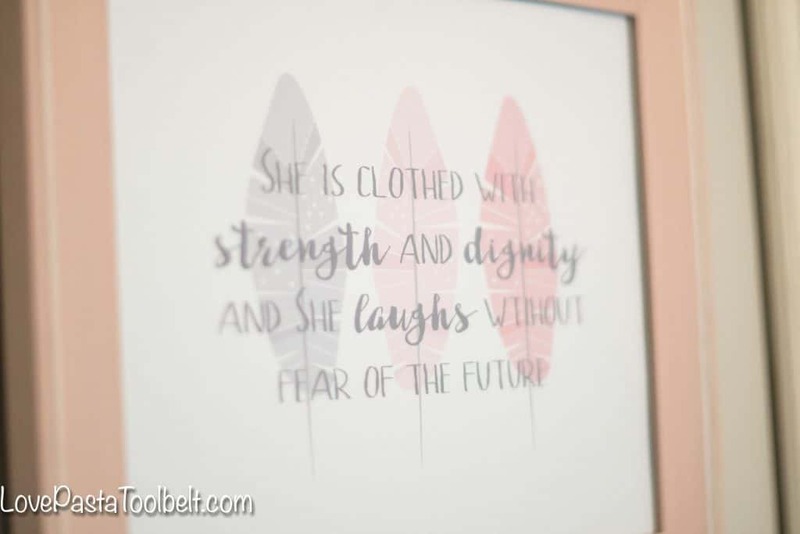 I created a few cute little printables and decided to leave the rest of the frames empty without their backs because I really like that look. The next step was figuring out how to arrange them. This is where Tyler stepped in with a brilliant idea. We had some large pieces of cardboard in our garage from the furniture for K’s nursery arriving. So he took one and laid it on the floor in the nursery. I took the frames and arranged them on the cardboard how I wanted them to be. It was great to have a visual before any holes went into the wall. You could also do this with packing paper or any large paper. Once I had the frames arranged Tyler traced them and then put marks on the cardboard where the nail holes would need to go. 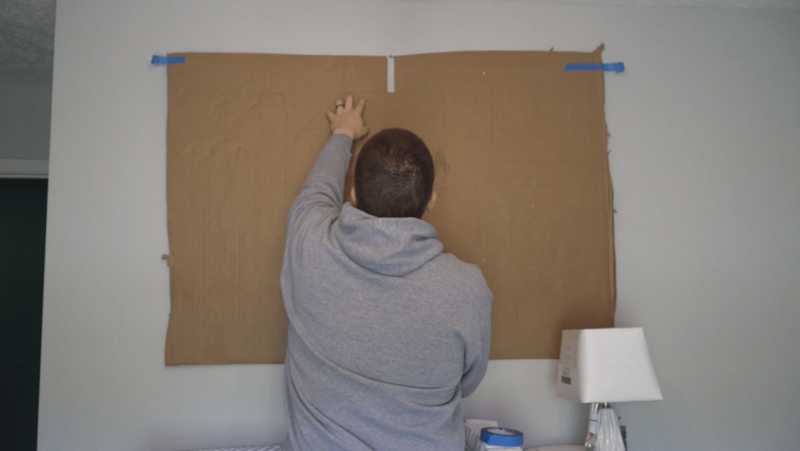 We then took the cardboard and taped it up on the wall where the gallery wall would go. 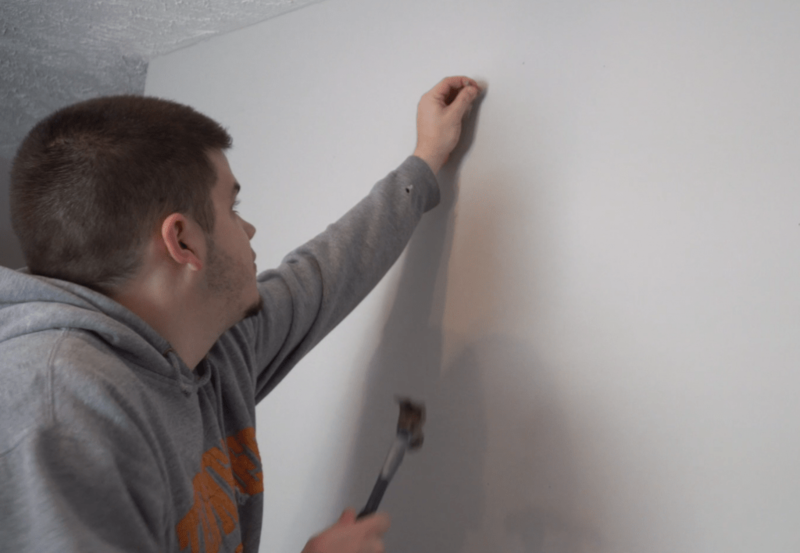 Once it was in the right place then Tyler hammered the nails in through the cardboard so he could make sure to have the nail holes in the right spot. Once the holes were set he removed the nails and took down the cardboard. Then he put the nails back and hung up the frames. There was only one frame that was a little crooked and had to be redone, the rest came out perfectly. 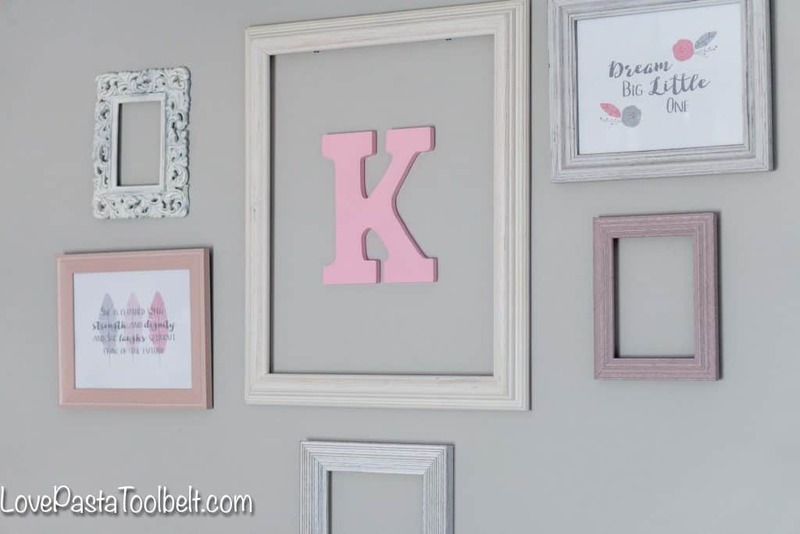 We spray painted a K pink and put it in the middle of the large frame that is the center of the gallery wall. And then viola our beautiful Nursery Gallery Wall was done. I love how it turned out and am looking forward to doing another one once my stairway gets painted. 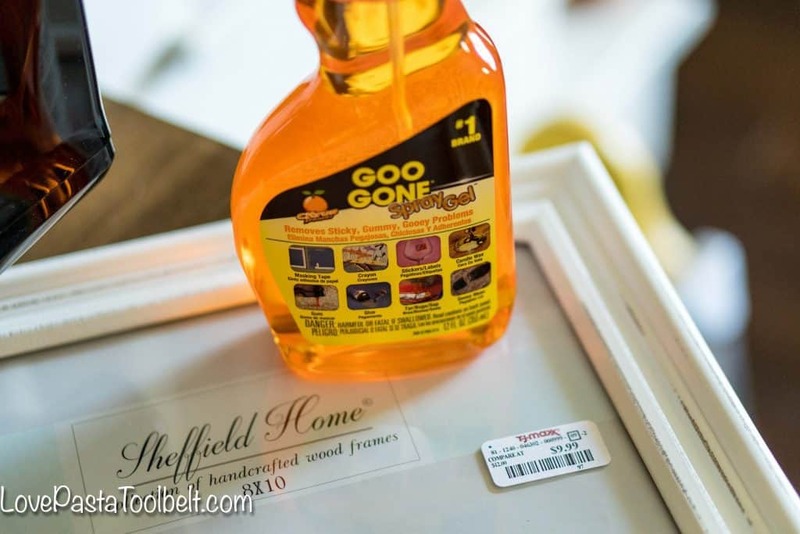 And I will most definitely be using my Goo Gone Spray Gel to help get all the annoying stickers off the frames. 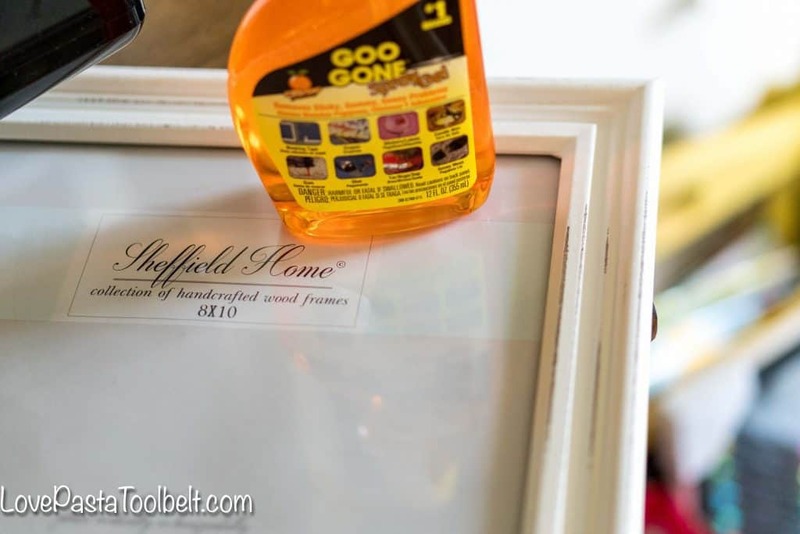 Do you have a project you’ve used the Goo Gone Spray Gel for? Or one you really wish you’d had it for?